Contents: Mashed potatoes, gravy, turkey, and a roll. Notes: This looks like prison food. 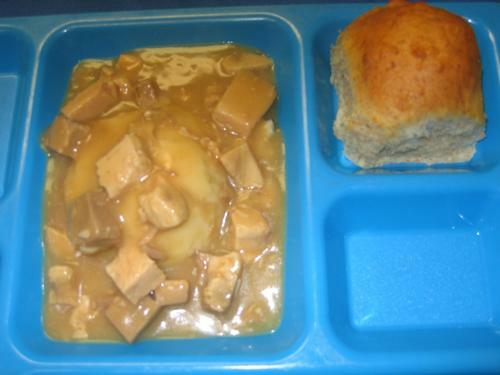 I am told the food in prison can actually be much better than the food in school lunches, in the US. This looks like wet cat food. I was honestly hoping there would be more than just what was on there--at least some cranberry sauce? "I am told the food in prison can actually be much better than the food in school lunches, in the US." Go figure--I halfway thought it'd be better in schools. But, then again, I'm sort of new to this "What's for school lunch" thing and noting how good or bad they are. Everything about this 'meal' is wrong!! All of you are retards. I can remember getting in trouble in high school for my responses to some of the meals they served. I was a very "unladylike" young woman--but then, so was some of what they served us! This was my favorite school lunch as a kid. It may be because I had no point of reference for American food. My parents are Chinese and only cooked Chinese food at home. Only in America would people think canned gravy and turkey tastes good. Gross. This is not a popular dish with the kids at our elementary school, but is popular with the teachers. Salty! I LOVED this and other school lunches back in the day. Lol looks like my throw up tbh.